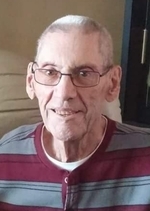 On Wednesday, August 1, 2018, Alexander Francis Whitelaw, age 91 years, passed away at the Brandon Regional Health Centre. Alex will be lovingly remembered by his wife Mary; daughters Diane (David) Wells and Donna Anderson (Ernie Bessant); grandchildren Carrie Sapach (Darcy Hall), Jo-Anna Sapach, Colin (Cody) Anderson, Chantel Anderson (Jason Cameron); great-grandchildren Devin, Caden, Teegan, Van, Riley, Reese, Nolan, Nash, and many nieces, nephews and extended family. He was predeceased by sons-in-law Ronald Sapach and Adrian Anderson and all of his siblings. Alex will be laid to rest in a private ceremony at the Riverside Cemetery, Neepawa. Donations in memory of Alex may be made to the Canadian Cancer Society, 415-1st Street, Brandon, Manitoba R7A 2W8.